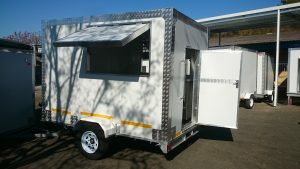 Mobile Kitchens for sale in Durban, South Africa. We are the leaders when it comes to manufacturing mobile kitchens because don’t compromise on work ethics and principles. Mobile catering is the business of selling prepared food from some sort of vehicle. It is a feature of urban culture in many countries. In addition to being operated as private businesses, mobile catering vehicles are also used after natural disasters to feed people in areas with damaged infrastructure. Our mobile kitchens for sale can be custom made to your specifications if you desire it or you can purchase our standard design. Steel wipe down walls for heat-resistant interiors up to 500 degrees. Our mobile kitchens are number one when it comes to quality and design. We manufacture our Kitchens on an international level.